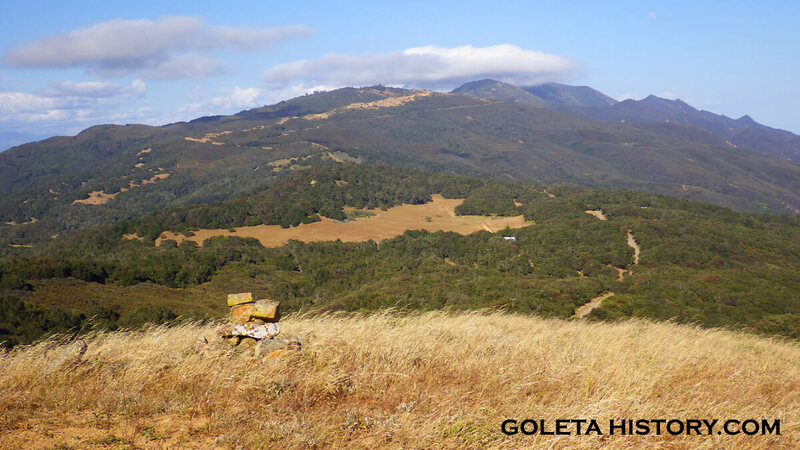 High above the Gaviota Coast, where the Refugio Pass reaches the crest of the Santa Ynez Mountains, there exists a grassy hollow, a level break in the dense oak and chaparral forest. Nestled in this dish shaped glade is a small lake with a few nondescript buildings scattered about. From the air, the topography is more interesting than the improvements. 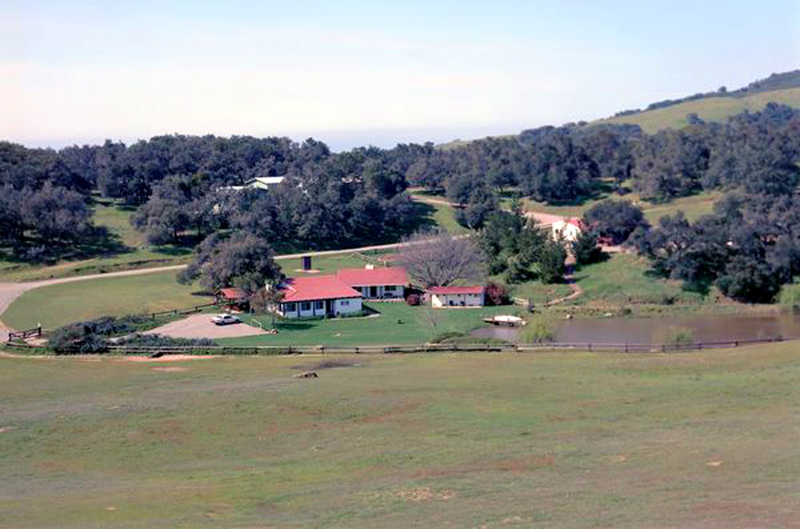 A casual observer would never imagine this to be the beloved ranch home of the most powerful man on earth, but for nearly 25 years it was exactly that. 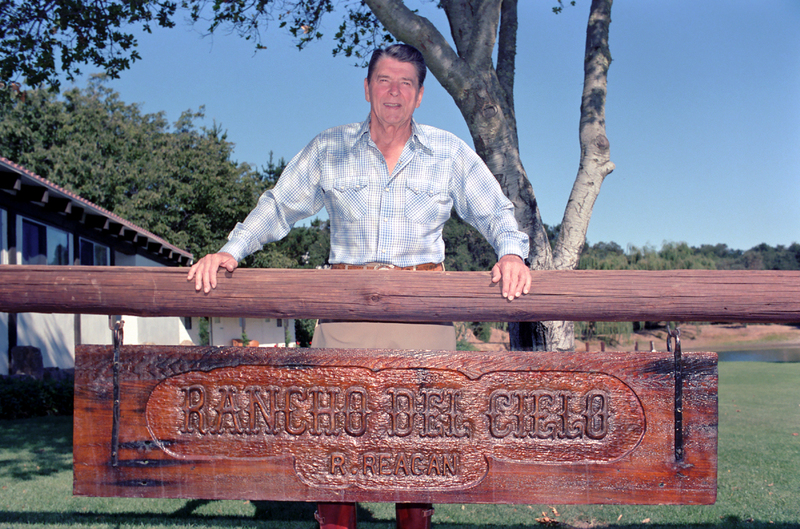 Ronald Wilson Reagan, the 40th President of the United States was so enamored with this unique location, he named it Rancho del Cielo. The word cielo means both sky and heaven in Spanish, and most folks assume he meant Ranch of the Sky. 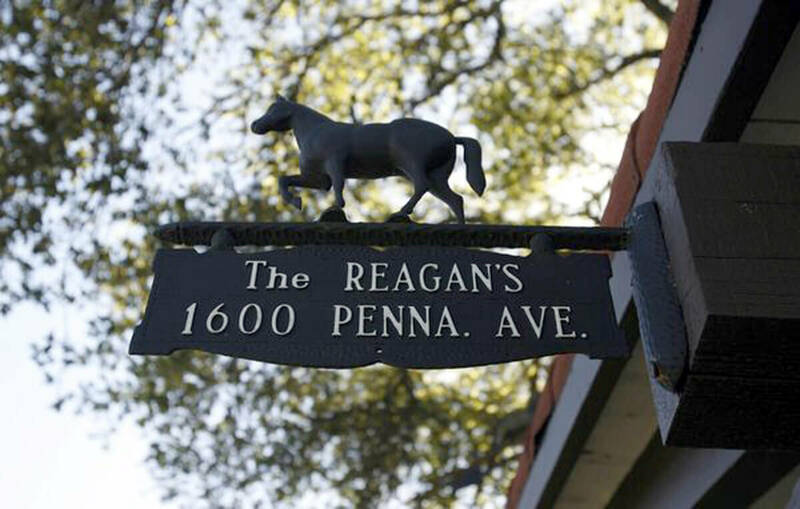 But when you hear how Reagan talked about this place, it seems more likely he named it Ranch of the Heavens or Heavenly Ranch. And the views from the ranch are indeed heavenly. 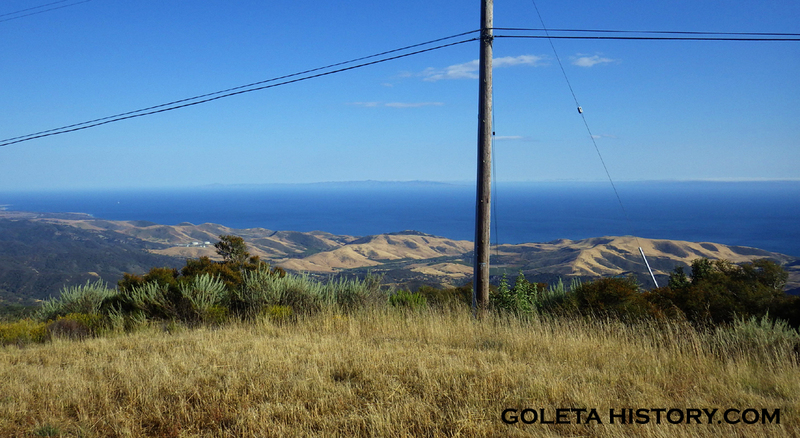 But despite its pleasant topography and amazing views, this slice of paradise has only changed hands a few times since the Spaniards ruled California. Probably because of the remote location, and the degree of difficulty it takes to get there. 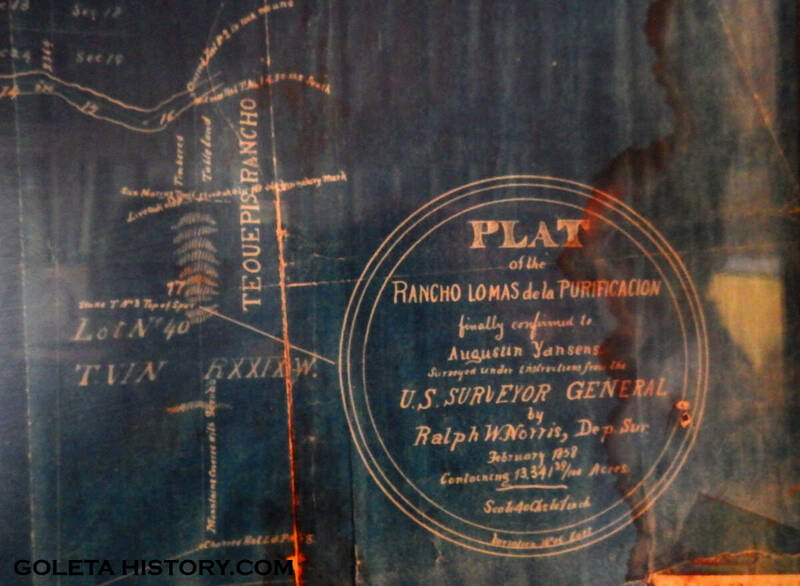 Rancho del Cielo sits on the border of the original Augustin Yansens land grant known as “Lomas de Purificacion”, or Knolls of Purification. 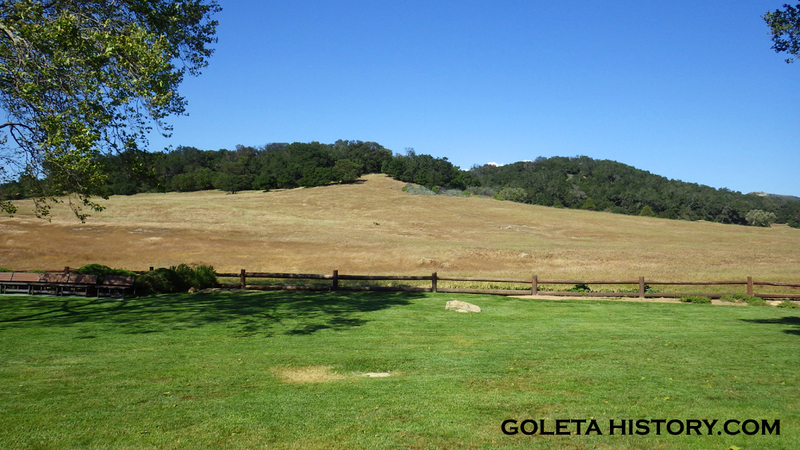 The grant was over 13,000 acres and extended from the Santa Ynez River to the mountain tops, just over 2,400 feet high. 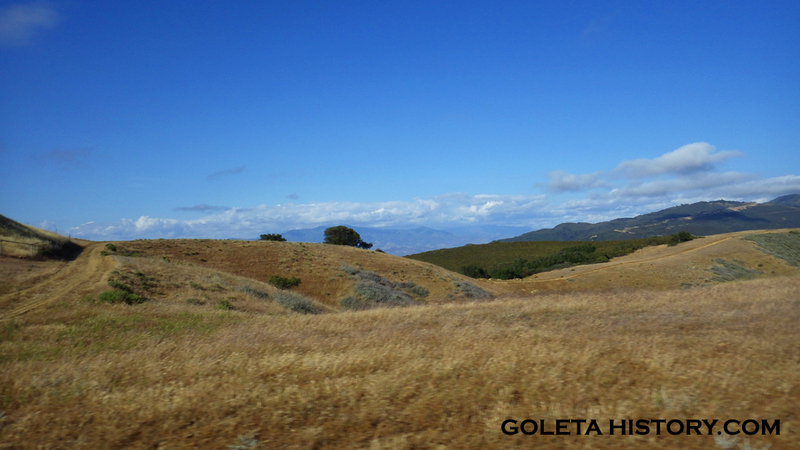 The Refugio Pass meandered through the “Knolls of Purification” and before the Gaviota Pass was widened, Refugio was often used by ranchers to bring cattle over to Santa Barbara to sell. The Refugio Pass was also a notorious location for outlaws to make camp and ambush those same ranchers returning to the valley with bags full of cash from their cattle sales. 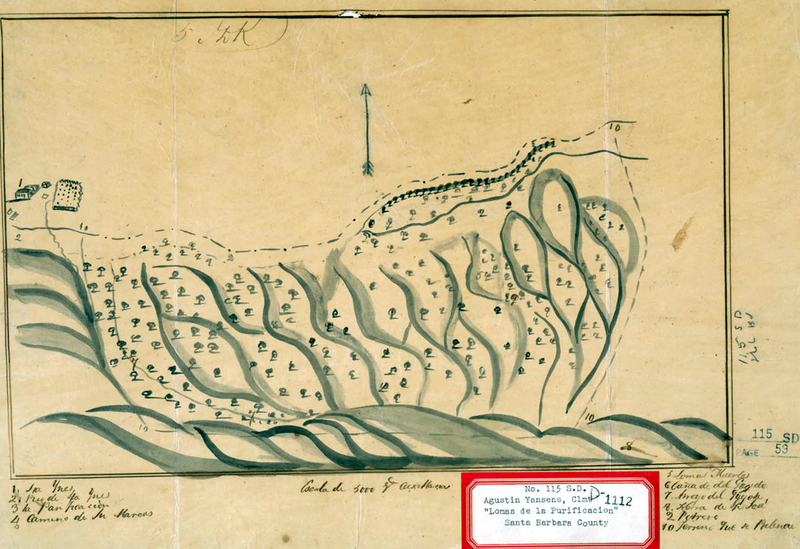 The banditos were known to have buried their stolen treasure, and some of their victims, at remote locations on the pass. 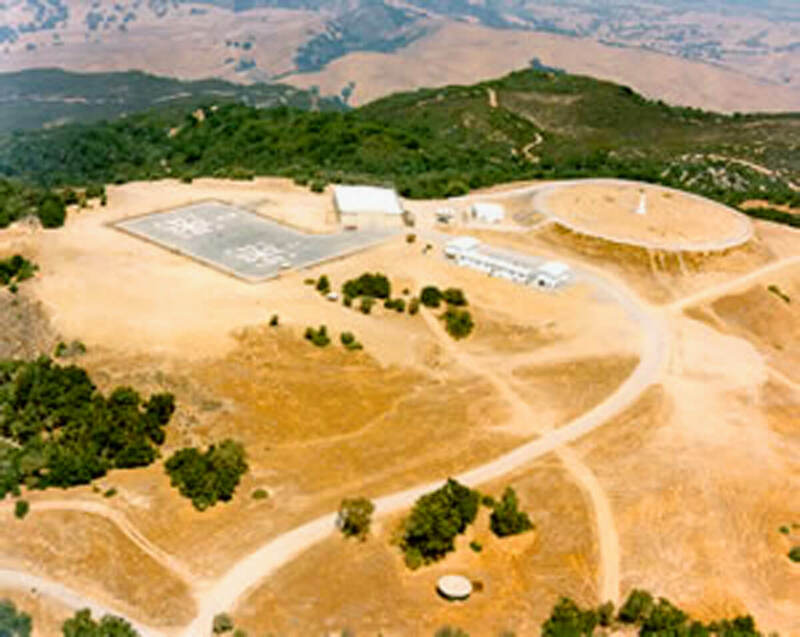 Around 1880, the dish like parcel adjacent to the land grant was homesteaded by a farmer named José Jesús Pico. Pico had farmed land further down Refugio Canyon, but moved up to the top of the mountains to take advantage of the frequent rainfall. 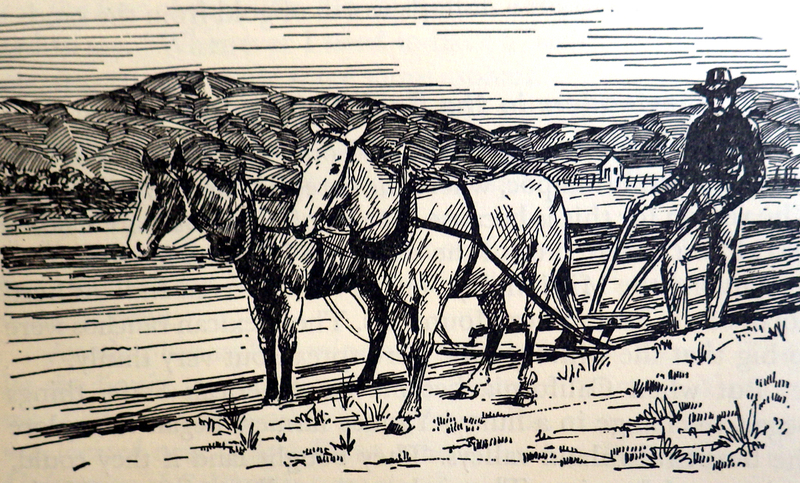 Rancho de los Picos raised livestock and abundant crops, including 5 acres of grapes that provided 900 gallons of wine a year! 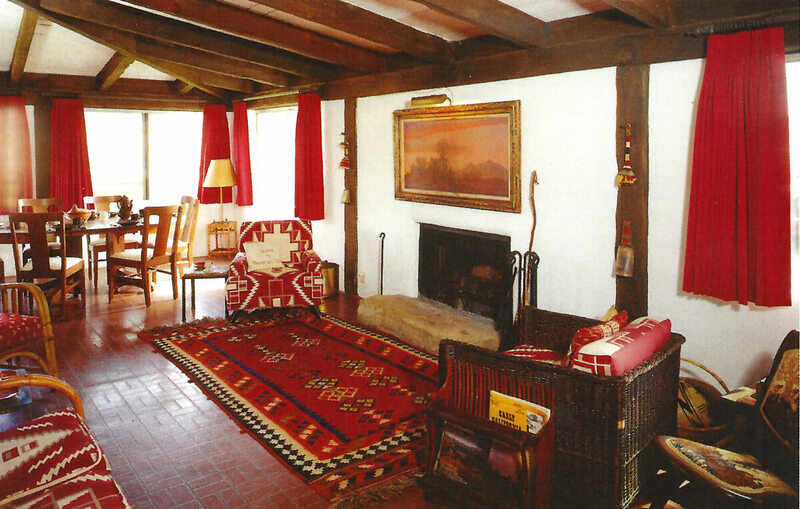 Pico hired a Chumash craftsman, Martin Volin, to build a small adobe home around 1887. 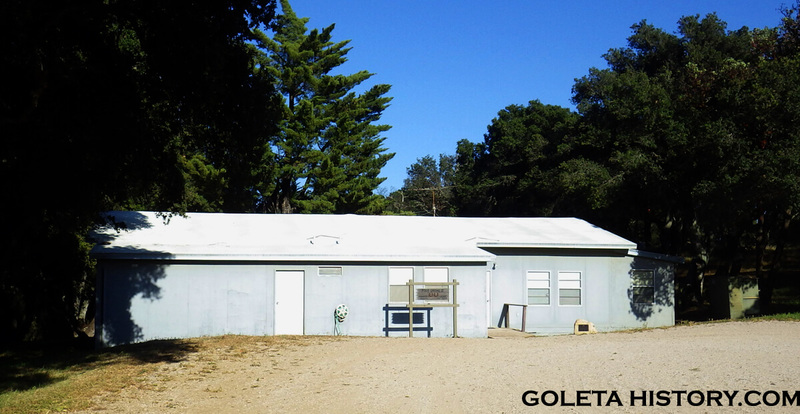 They later built another small building that served as a school for local ranch kids, including Pico’s seven children. One of Pico’s children later recalled digging up several skeletons around the ranch throughout the years, and while hoeing weeds one day, he unearthed six square silver coins. Very possibly, lost treasure and forgotten victims of the bandito days. 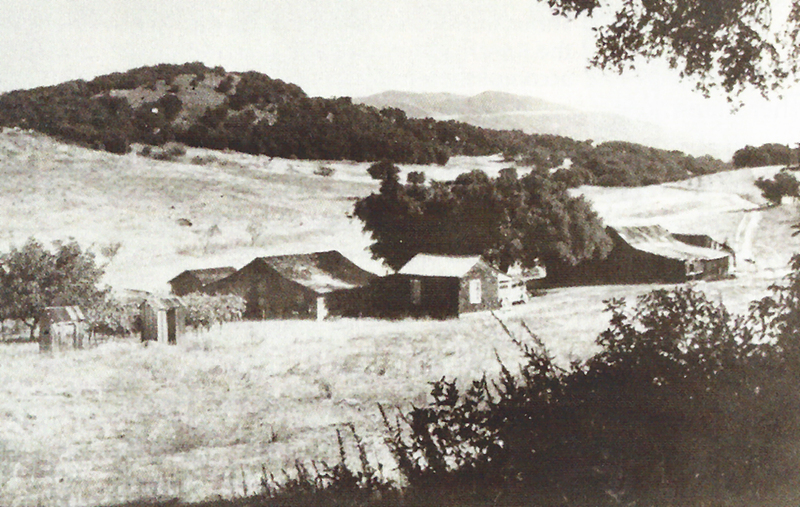 The Pico family sold the ranch to Santa Barbara County surveyor Frank Flournoy in 1941 for $6,000. 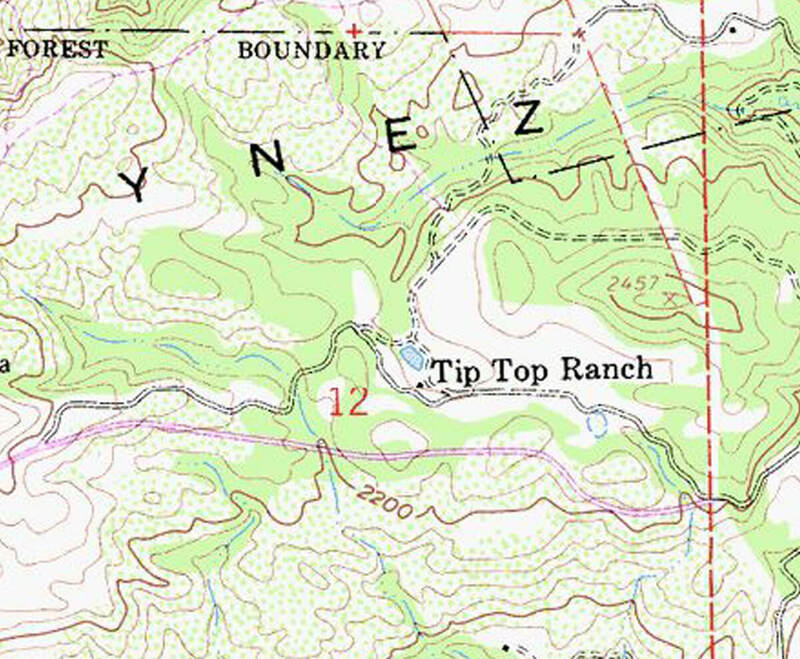 Flournoy changed the name to the Tip Top ranch, but he didn’t keep the ranch long. In 1955, he sold it to cattle ranchers Ray and Rosalie Cornelius. They were welcomed to the neighborhood by a huge wildfire just a few months later. 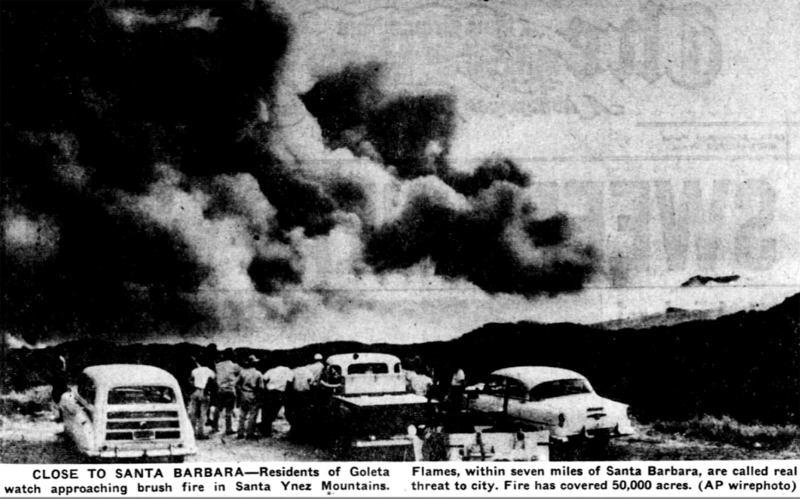 The Refugio Fire broke out just a mile away at La Scherpa Ranch, and burned over 70,000 acres. ( Coincidently, that’s the same ranch the Sherpa Fire started at in 2016! ) Some of the Tip Top Ranch burned, but Cornelius and his crew helped save the old adobe. After the fire, the burnt chaparral made way for more suitable grazing land for cattle. Seizing the opportunity, Cornelius purchased additional land surrounding his property, expanding his holdings to over 1,000 acres. Cornelius was a true cowboy and he ran as many as 600 head of cattle on the Tip Top Ranch. He brought electricity in and remodeled the adobe house, decorating it with old maps and bobcat pelts on the walls. 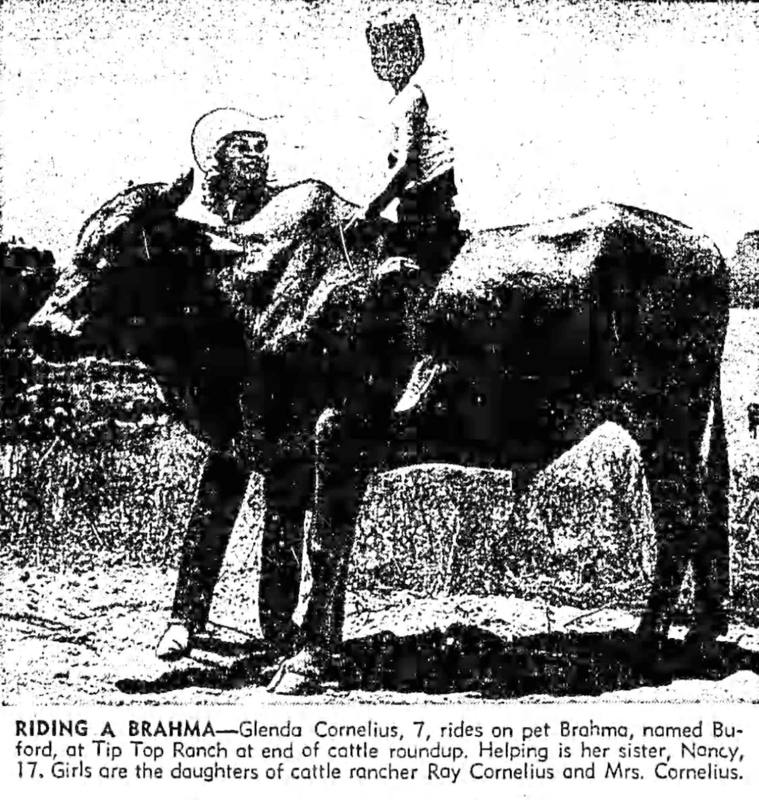 Cornelius raised his kids in the traditions of the Old West and his daughter Glenda was featured in a Los Angeles Times photo in 1959. In a strange coincidence, Glenda later went to a boarding school in Arizona where she roomed with a girl named Patti Reagan, who’s father was the governor of California. Patti later remembered Glenda as “a rodeo rider, a tall, sturdy girl who could rope a cow, tame a wild horse, and chew tobacco with the best of them.” Cornelius planned on Glenda taking over the ranch, but as fate would have it, she was killed in a car accident on New Year’s Eve in 1971. Overcome by sorrow, her parents decided to sell the ranch. 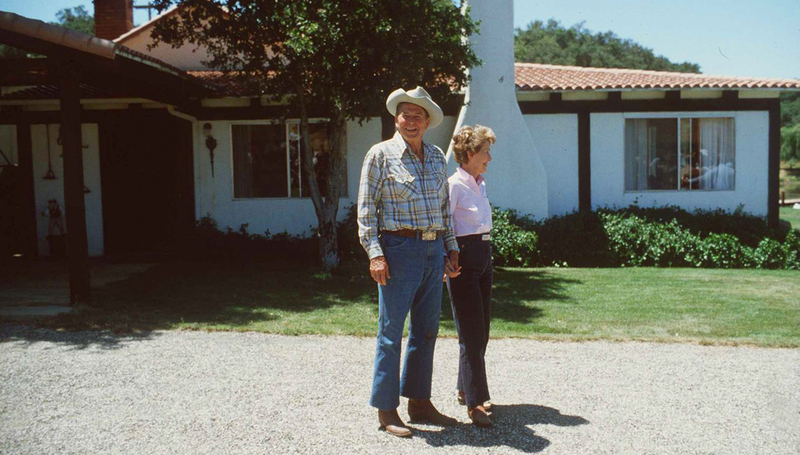 Around this same time, Governor Reagan had decided to sell his ranch in Riverside County and was searching for the perfect rural escape from the pressures of his job. 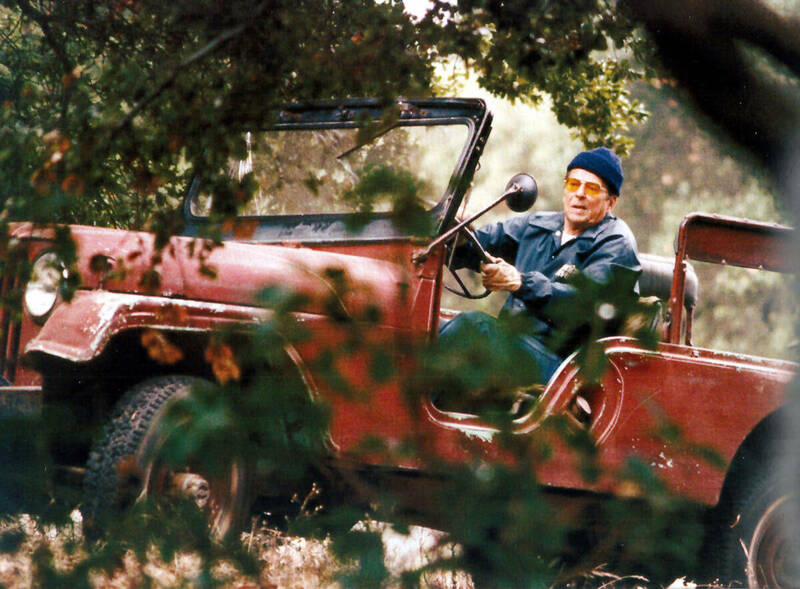 A longtime friend named Bill Wilson lived at the base of Refugio canyon and after frequent visits, Reagan became very fond of the area. In late 1971, they toured the recently formed Hollister Ranch, but it wasn’t exactly what he was looking for. Some time later, Wilson told the Governor about a property for sale at the top of the Refugio Pass, and he was eager to have a look. 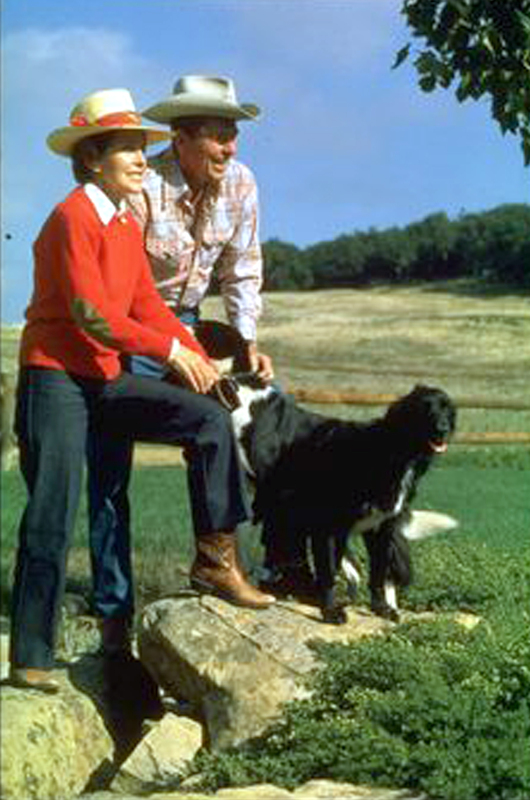 In 1973, Wilson drove the Reagans up the seven miles of narrow switchbacks to the Tip Top Ranch. 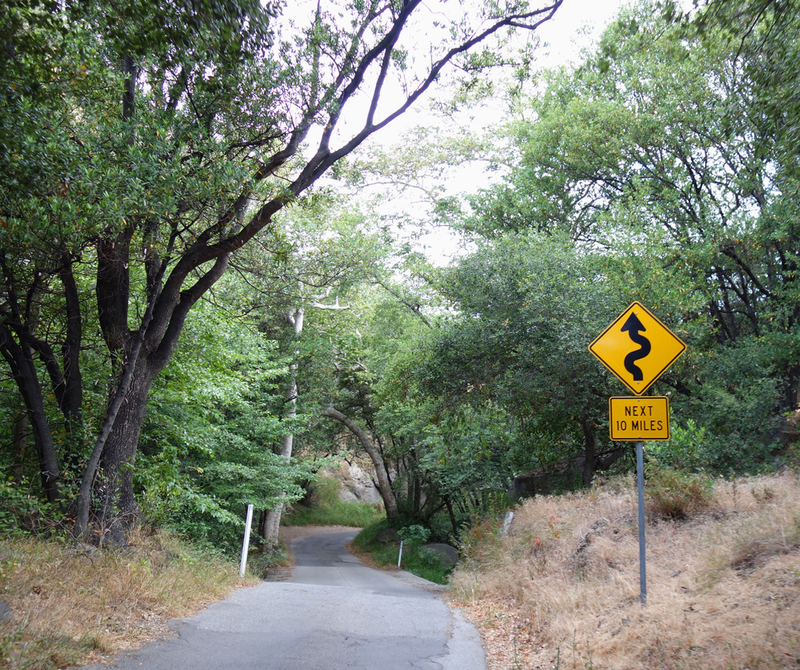 The winding, single lane road seemed to go on forever, and then another mile of bumpy private road after that. Nancy gently questioned their friend’s judgment about the remote location, but Reagan was in awe of the breathtaking scenery. When they finally arrived at the ranch, it was love at first sight. The remote location afforded unmatched serenity. No sounds except wind and birds, no signs of civilization, other than the small buildings built by the Pico family a century before. 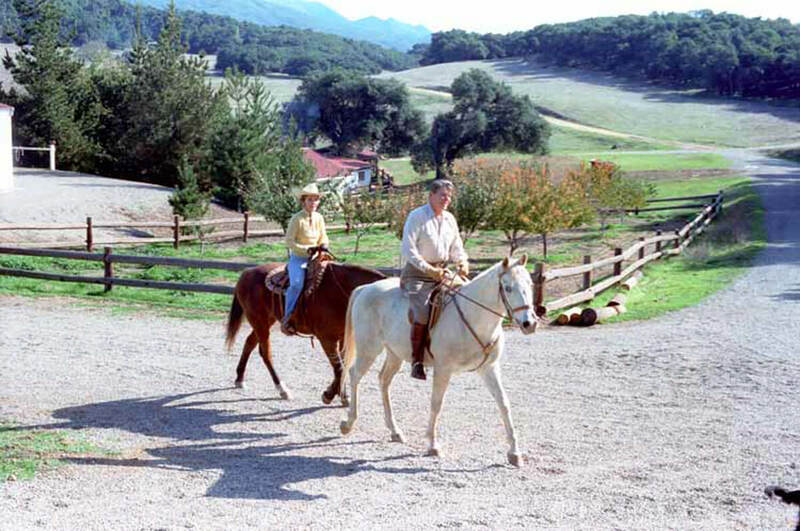 Reagan was later quoted as saying, “If it’s not heaven, it’s at least in the same zip code.” After a year of negotiations, the Reagans bought the ranch from the Corneliuses for about $500,000 in 1974, just as his second term as Governor of California was coming to an end. When they bought the ranch, there wasn’t much to it. The Pico adobe was in pretty bad shape, with old aluminum sheets for a roof, there was no pond, very few trees around the adobe and no fencing at all. 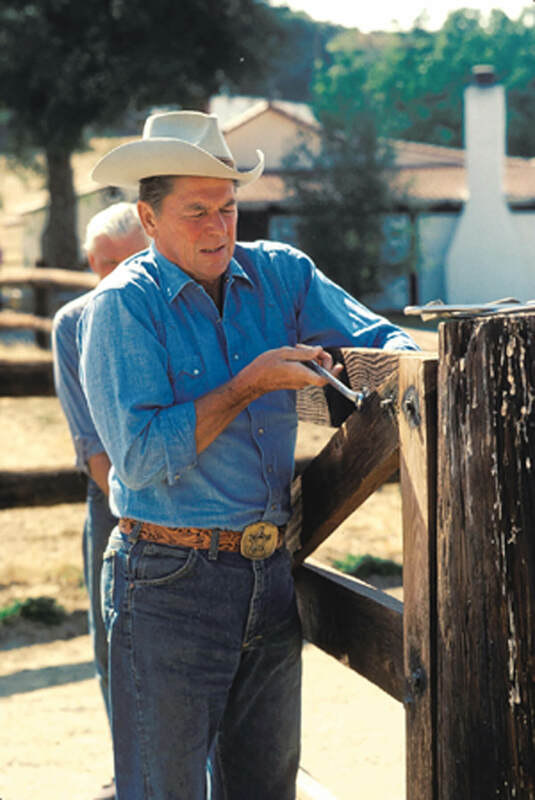 But Reagan had owned several ranches in his life, and he loved this kind of work, so he literally rolled up his sleeves and went to work. He repurposed some old telephone poles and made a sturdy fence around the main compound. 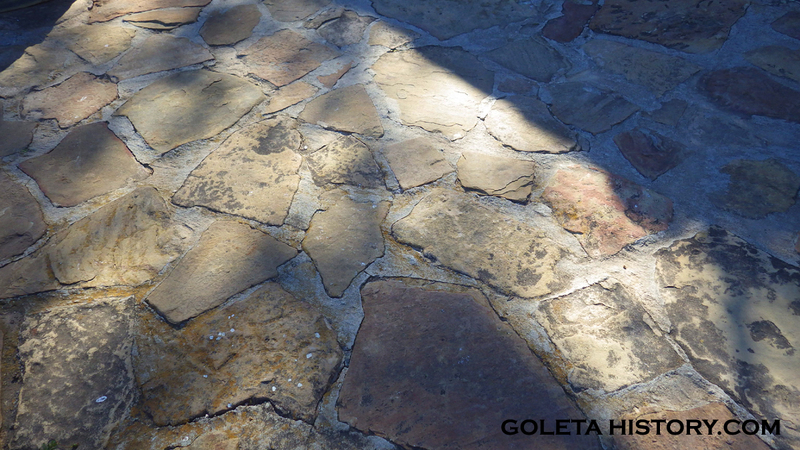 He collected sandstone slabs from around the property and built a natural stone front patio. 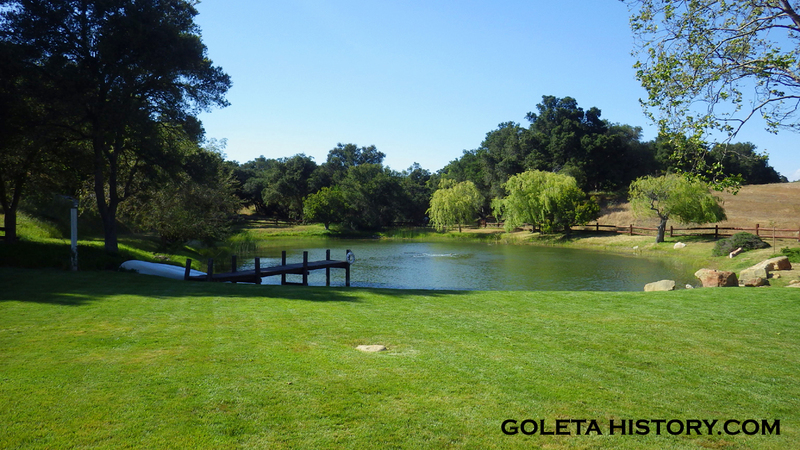 He had a pond built near the house with a small dock and he named it Lake Lucky. He had the front porch of the adobe enclosed, making the living space larger, and decorated it in true California ranch style. 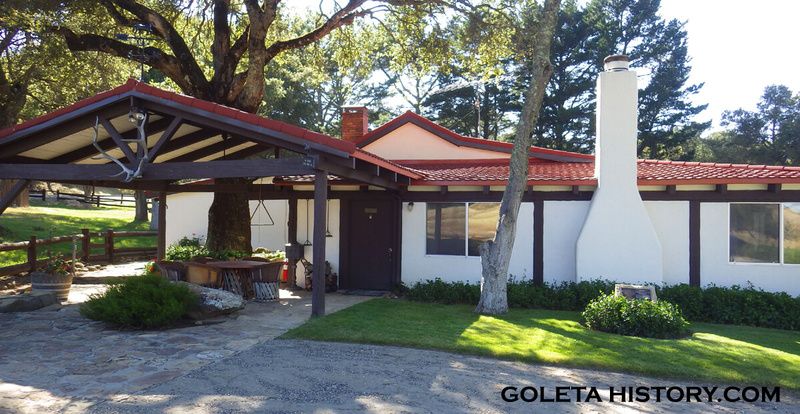 And he topped it all off with a new tile roof, giving his dream ranch modest, but comfortable, shelter. 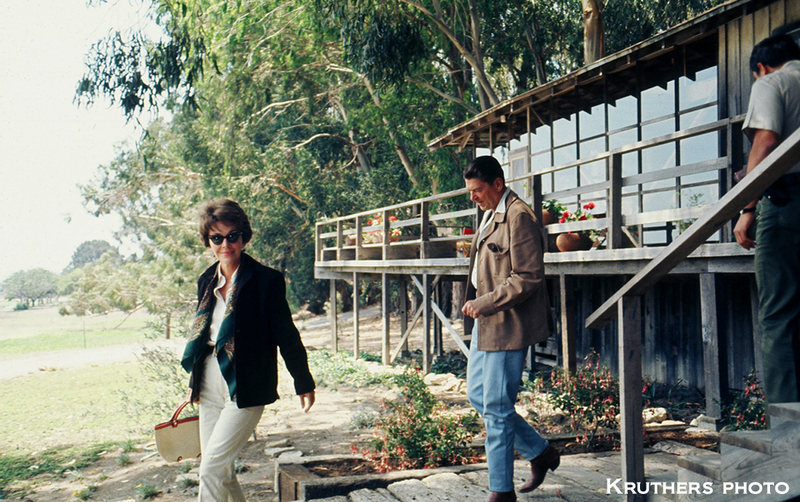 Reagan appreciated the history of his ranch and he kept certain elements of the original adobe in his home. This map of the neighboring land grant is hanging on the wall. 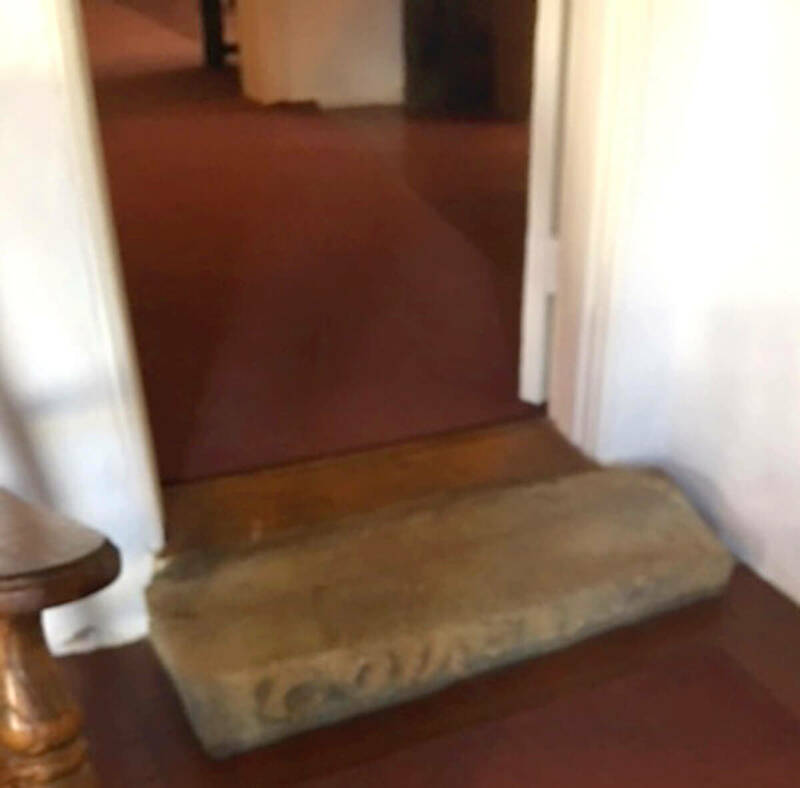 And he left this original stone step from the Pico adobe inside the home when he remodeled. 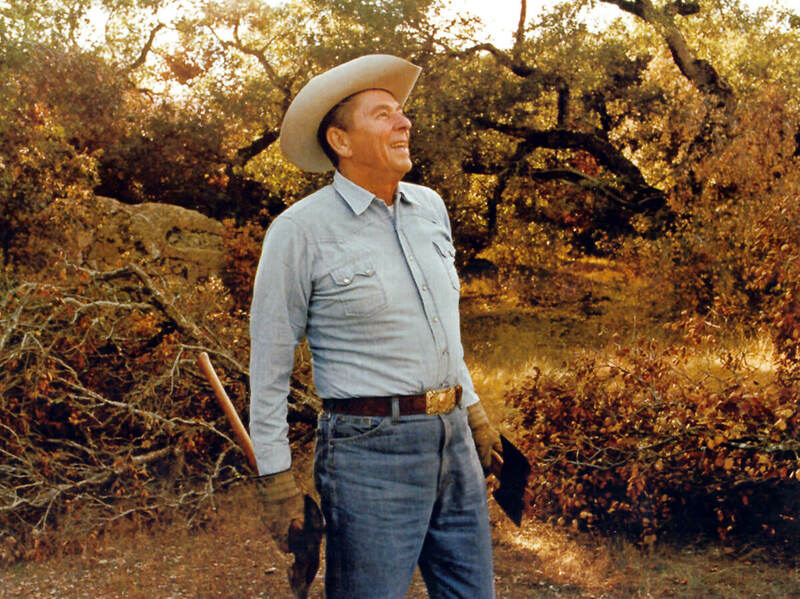 The work at the ranch never ended, and Reagan liked it that way. It was a welcome relief from the stress of his public political life. Physical labor was his way of cutting loose. 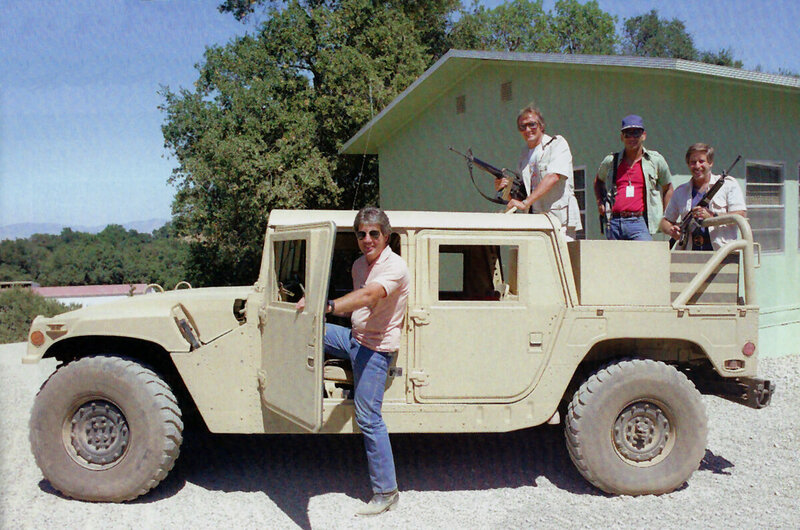 Presidents don’t get to drive very often, they’re usually in the back of limousines, so when Reagan was at the ranch he loved to drive his Jeep. 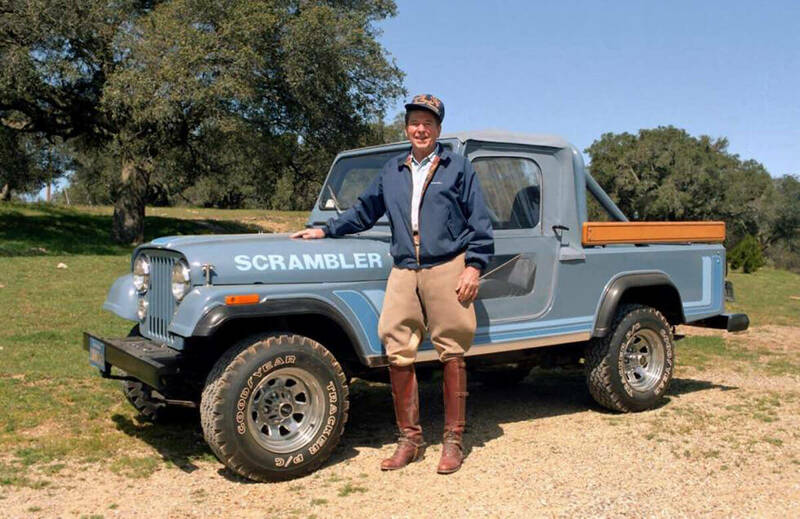 The CJ-6 was Nancy’s 1963 Christmas gift to her husband and he used it on two of his ranches. His Jeep was used for the heavy chores on the ranch and it was pretty beat up, with dents and dings and tape holding the seats together. 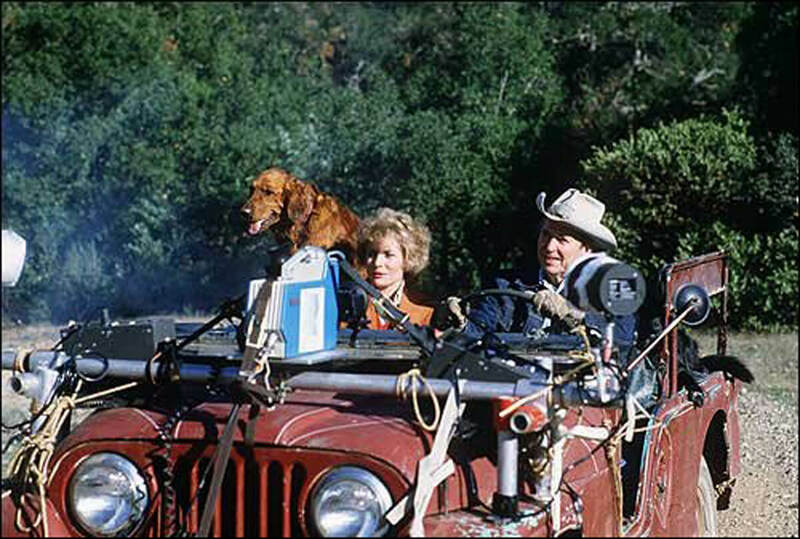 But he loved driving that Jeep around with his ranch dog as his co-pilot. 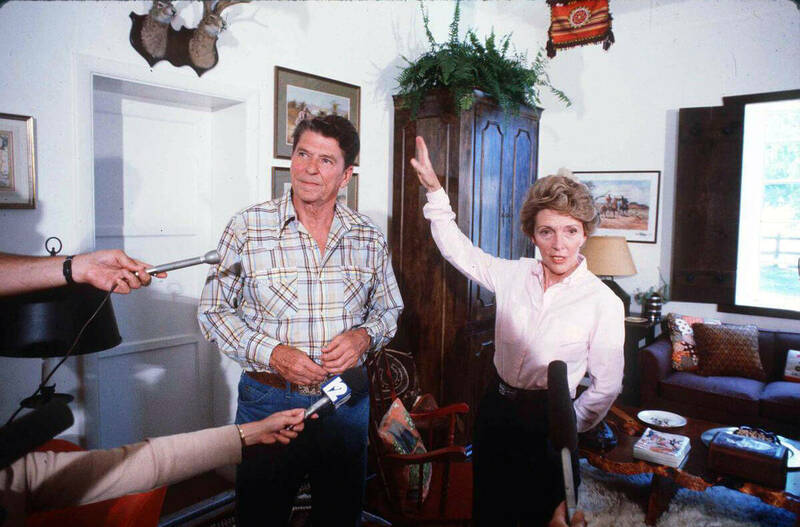 When Barbara Walters came to interview the President, he gave her a tour of the ranch in the beat up old Jeep. After he was elected President, the press was dumbfounded that the leader of the free world would actually want to chop brush and cut wood. They tried to make light of it, but as you can tell by the look on the President’s face, he couldn’t have cared less. Ranch life was his true love. Well, it was one of his true loves…Of course Nancy was also his true love. 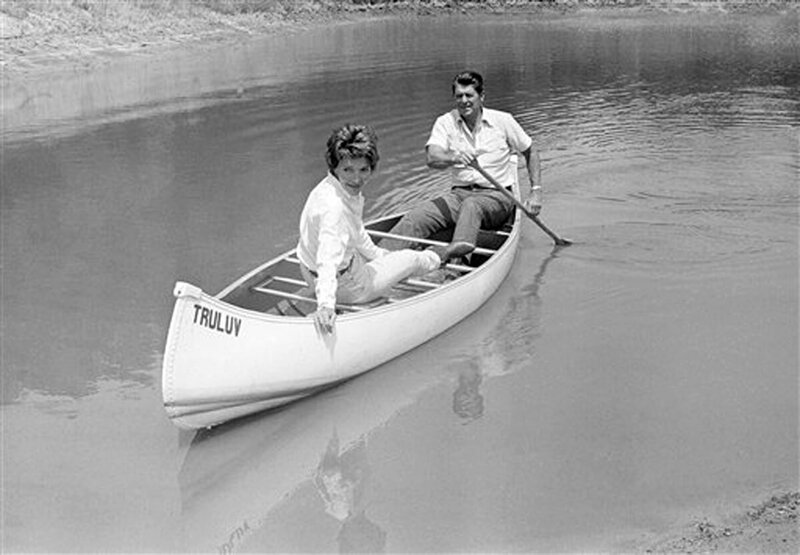 He named a canoe TruLuv in her honor, and he would paddle her around Lake Lucky in it, just for fun. Nancy also enjoyed being at the ranch; the solitude, riding her horse and being out in the country. But mostly, she knew how much her husband loved being there, and how much he needed to be there. Probably the single thing she most enjoyed about their visits was the privacy. 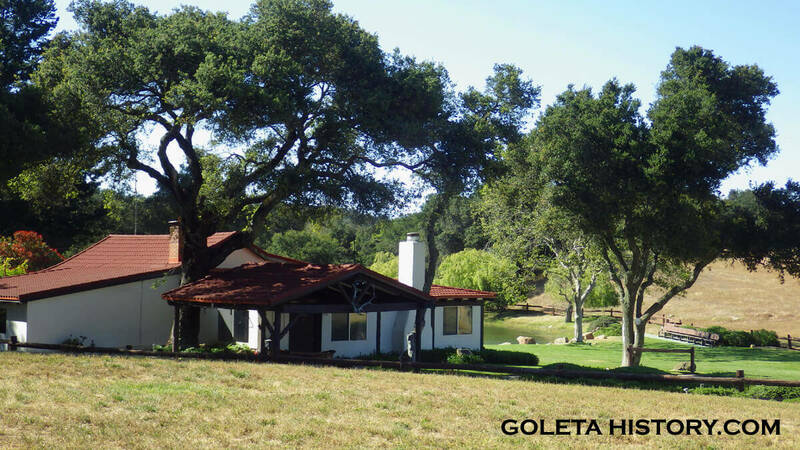 Rancho Del Cielo offered her the chance to be alone with the man she loved. 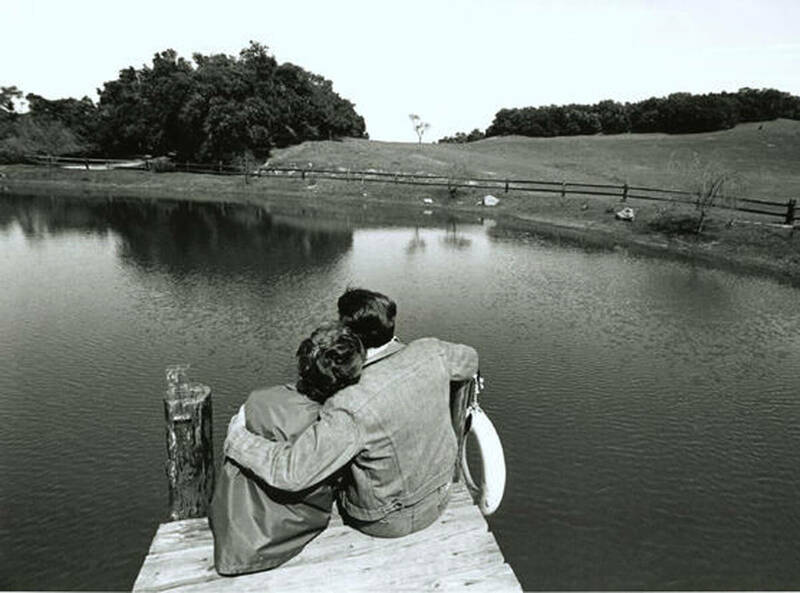 Reagan once said, “No place before or since has ever given Nancy and me the joy and serenity it does.” They really were like two young lovers that just enjoyed being alone together, and that’s a rare commodity for such public figures. 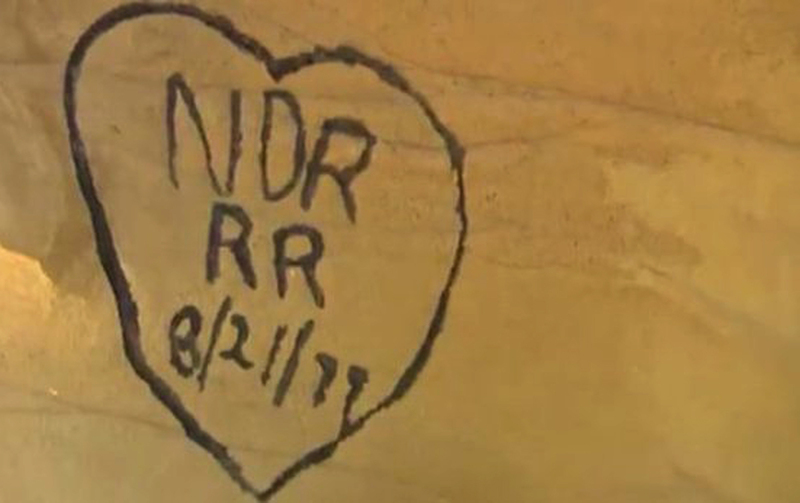 In a remote location on the ranch, overlooking the Pacific Ocean, Ron carved this heart with their initials in it. A stone testament to their love and devotion. 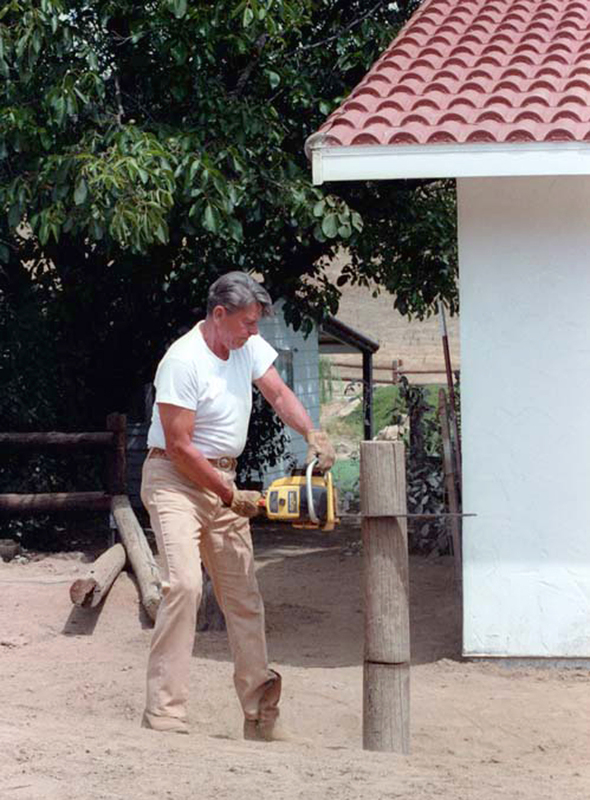 When Reagan became President-elect in 1980, Rancho Del Cielo needed some serious security upgrades. To get the place in order, the Navy Seabees were sent up to do the work. 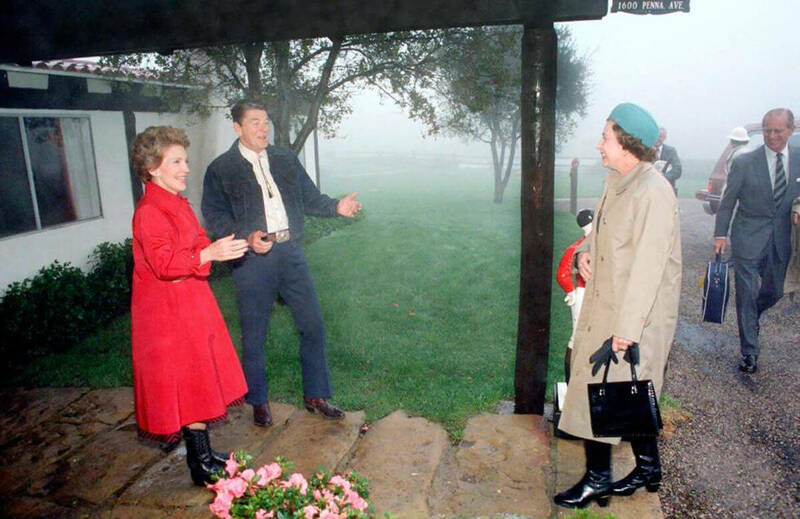 After the work was done, The Reagans hosted a barbecue for the Construction Battalion. The Seabees built multiple service buildings as well as helicopter pad and a heliport. 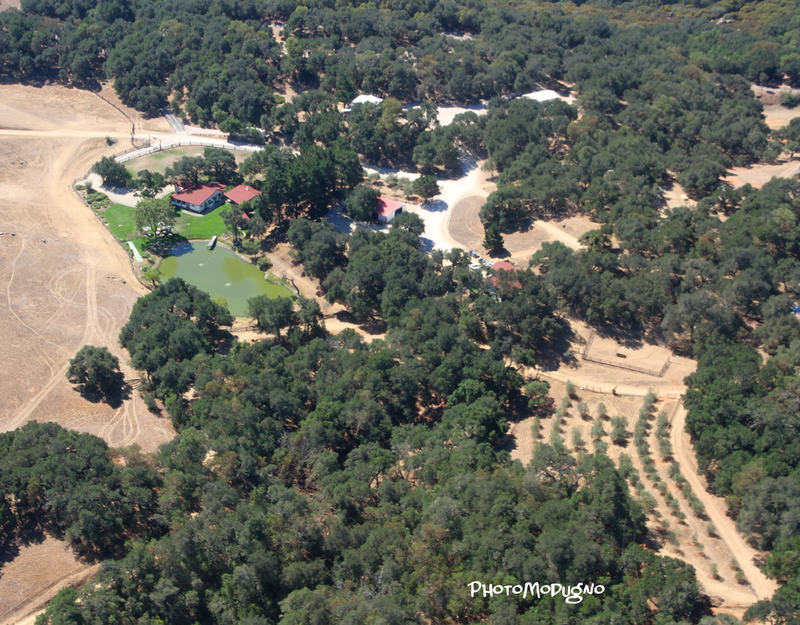 To maintain the natural feel of the ranch, trees were planted to hide them from view. When the First Couple was there, the security personnel tried to stay as invisible as possible so they could enjoy their visit in peace. Sometimes over 100 agents would be on site when the President was visiting. As President, Reagan got to the ranch aboard a helicopter called Marine One that landed on a helipad the Seabees built at the ranch. 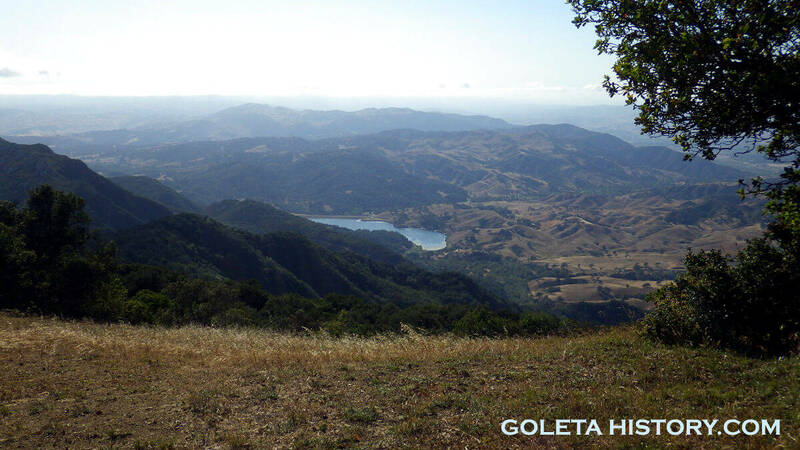 Goleta residents usually knew when he was headed up, because a group of armed helicopters accompanied Marine One and that was quite a sight to see, and hear! Of greatest importance was the ability of the new President to be able to communicate with his Washington staff while he was at the ranch. To facilitate that in time for his first visit after his inauguration, the Secret Service laid out a telephone line on the ground along the road all the way up to his ranch. 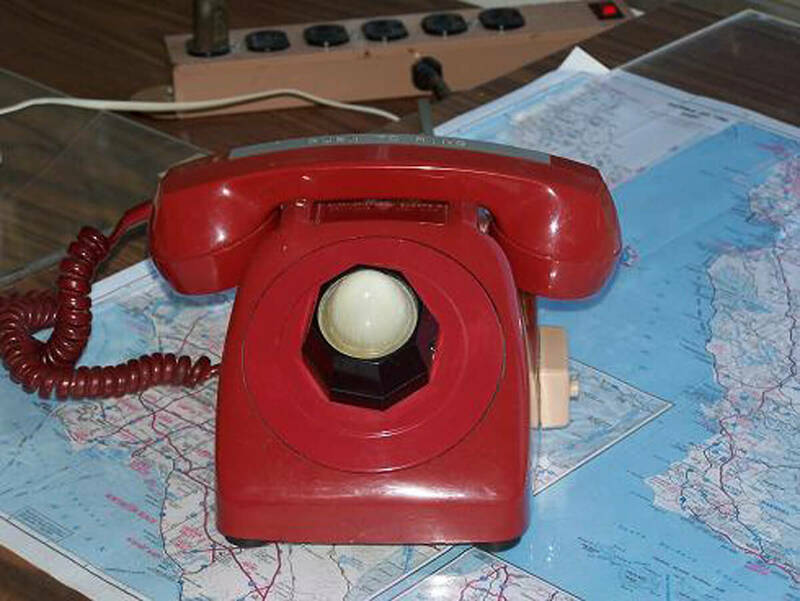 For weeks the leader of the free world made his contacts via a line that could have been cut, or worse, tapped into! Members of the ranch detail loved the relaxed atmosphere and the chance to get out of their suits and bullet proof vests. However, protecting a President that liked to take long horseback rides in the wilderness presented a lot of challenges. 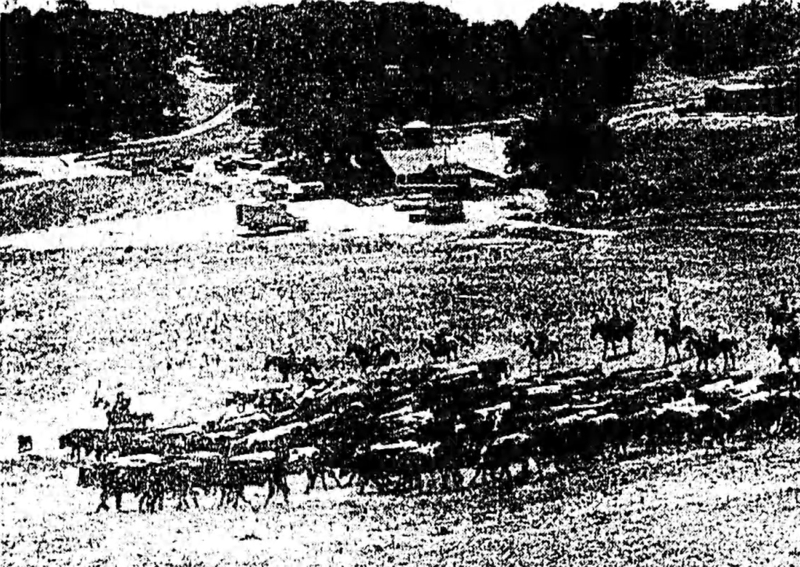 As many as twenty nine Secret Service vehicles were kept on the ranch, as well as counter assault teams and canine units. 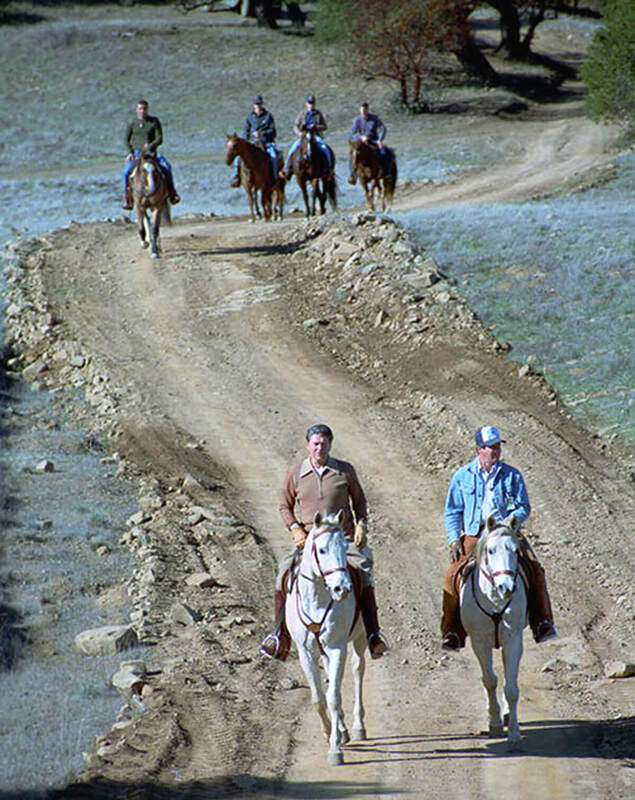 The Secret Service named and mapped the seven miles of trails on the ranch, and before the President took his daily ride, he would tell them where he was going to go. Rather than posting signs everywhere, they drilled numbers into rocks on the trails to identify locations. 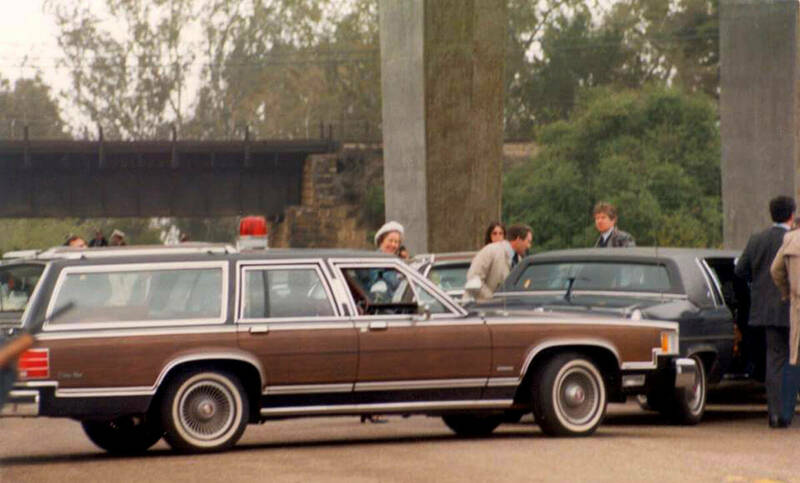 They had hollow fiberglass ‘boulders’ that housed motion detectors and communications equipment, so the secret service could keep tabs on “Rawhide”, the President’s code name. Security needed to know exactly where he was at all times and have escape routes planned in case of an emergency. Sniper teams were stationed on hilltops around the ranch, constantly scouring the area for assassins. The President enjoyed solitude on his daily ride, but his office required a caravan be close by at all times. Security agents, military aides, medical professionals, and international communications all followed discreetly at a safe distance on horseback and in vehicles. His riding partner and personal security detail, agent John Barletta, rode alongside him on a matching horse, making it difficult for an assassin to identify the President at long range. 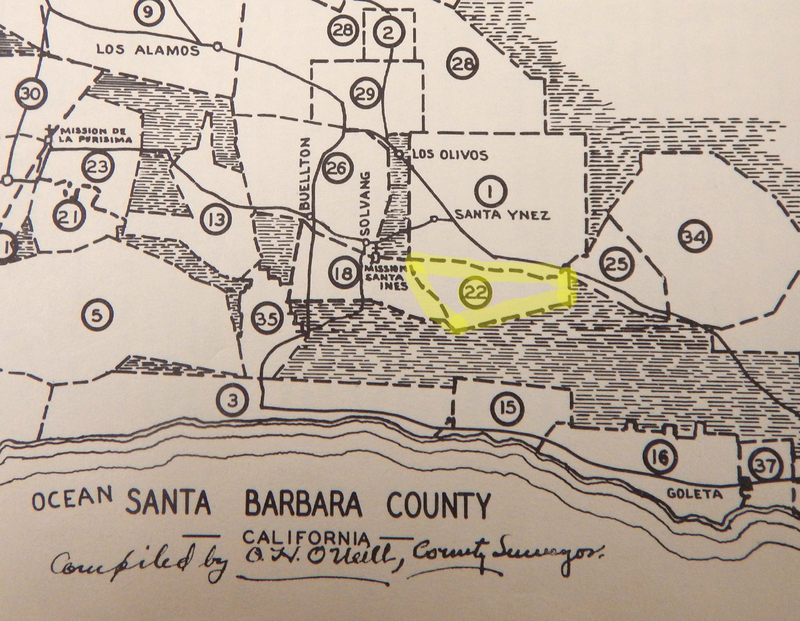 Whenever the President was at the ranch, Navy Intelligence would detect Soviet submarines off the coast of California. While they were probably only gathering information, they were believed to be armed with missiles and a potential threat. For a worst case scenario, they had a closet in the tiny ranch house converted into a heavily reinforced Safe Room where the leader of the free world could take shelter. 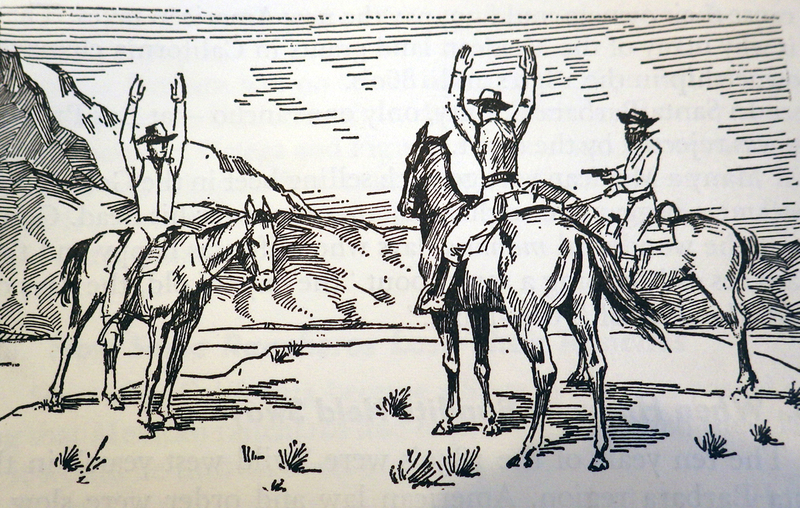 In the early years, a “no politics allowed” policy was strictly enforced at the ranch. But once elected President, that became impossible. He was always on call, and his visits were really working vacations. 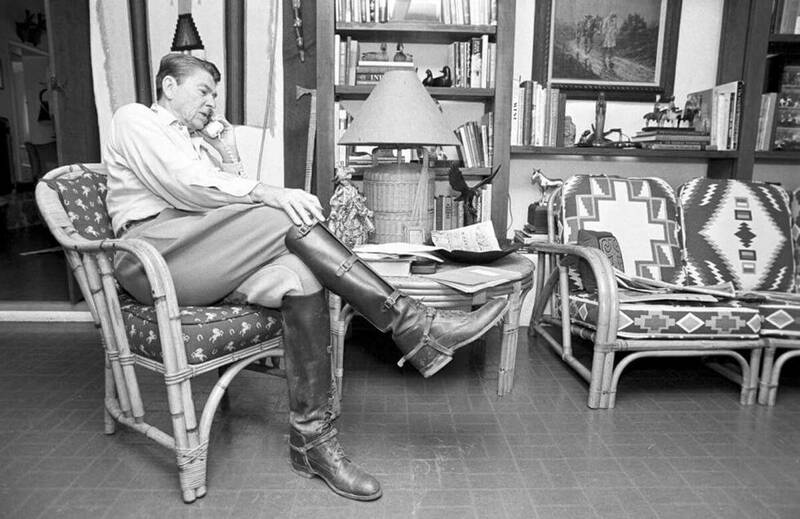 Select members of his staff often came to visit him at the ranch, but Reagan was determined that it would not become a “Western White House”. It was his getaway, not his office. But he still delivered his weekly radio address while he was at the ranch. 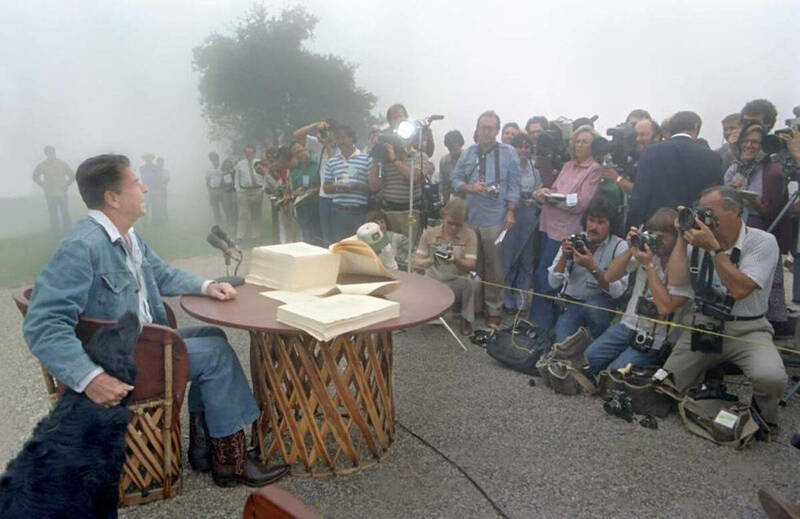 Dealing with the media was one of the things Reagan enjoyed getting away from at the ranch. He didn’t want the press souring his paradise, but he did allow them in a handful of times. One such time was for the signing of some important legislation. A very foggy day, he pointed out that it was the first bad day of weather all week. He joked, “I shall refrain from saying that you all are responsible for bringing it up with you”. The press usually stayed miles away in Santa Barbara hotels, so presidential vacations to the ranch were also vacations for them, lounging on the beaches of Santa Barbara. 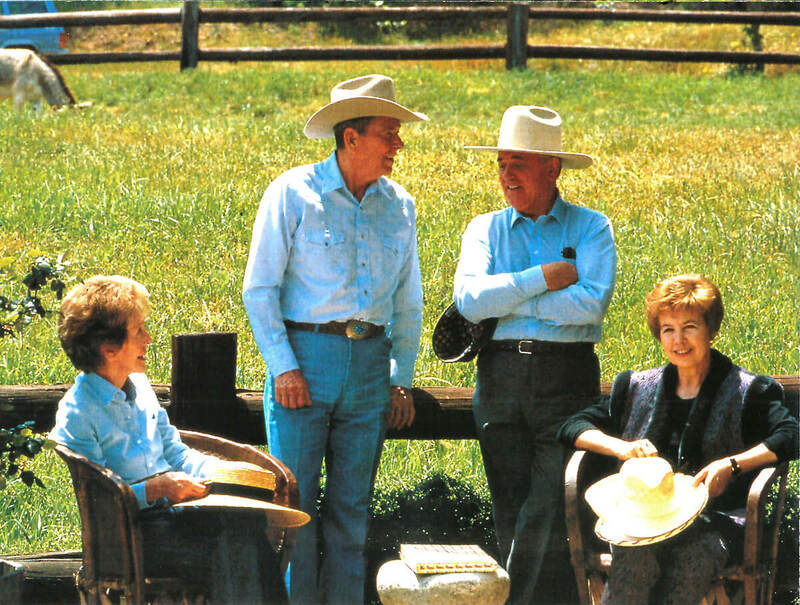 In 1983, Queen Elizabeth II and Prince Philip wanted to see the Reagan’s ranch while they visited the west coast. Unfortunately, their visit came in the midst of a powerful El Nino storm. They paused at the Refugio underpass and prepared for the dangerous trek up the pass. The Refugio Pass was always a challenging ride for dignitaries to endure, but this day it was flat out dangerous. 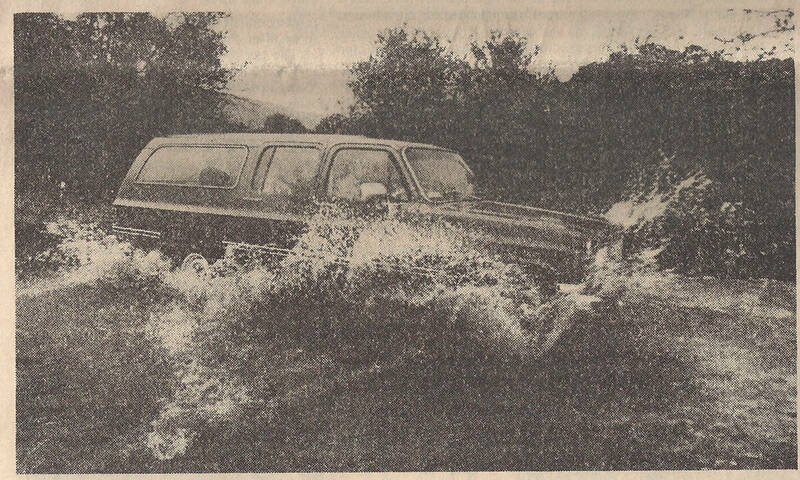 All the creek crossings were treacherous and barely crossable, even in four wheel drive Suburbans, but the Queen would not take no for an answer. And they made it. Once there, they stayed indoors by the warmth of the fireplace, stoked with wood that Reagan had cut himself. The Queen was thrilled by it all and said it was an exciting adventure. Another historic visit was in 1992, when the Reagans hosted the Gorbachevs, just five months after Gorbachev resigned as leader of the Soviet Union. 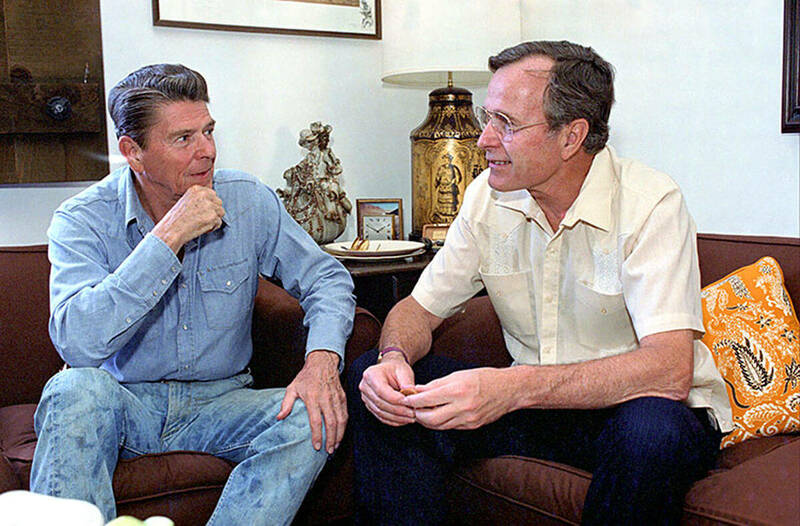 The two former superpower leaders enjoyed a relaxing day at the ranch as friends, who together changed the world. Some of the KGB could not understand how a country’s leader could live in such a simple house. 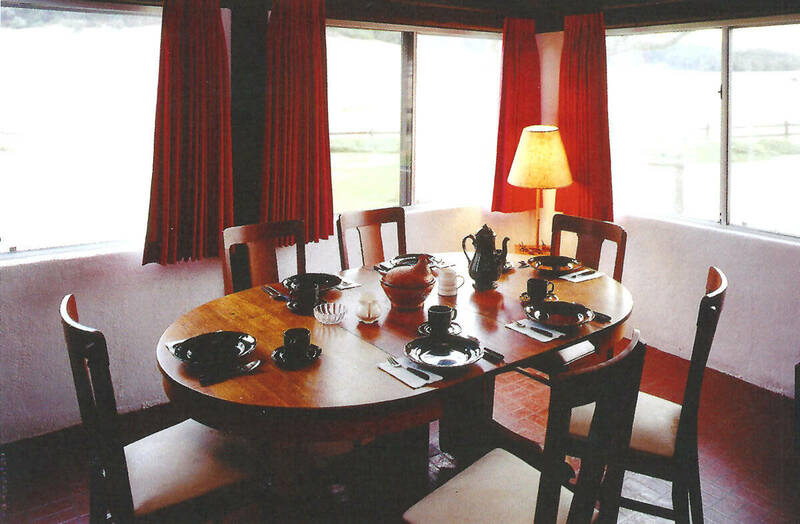 Inside their adobe home, this is where they would dine with world leaders, dignitaries and celebrities. 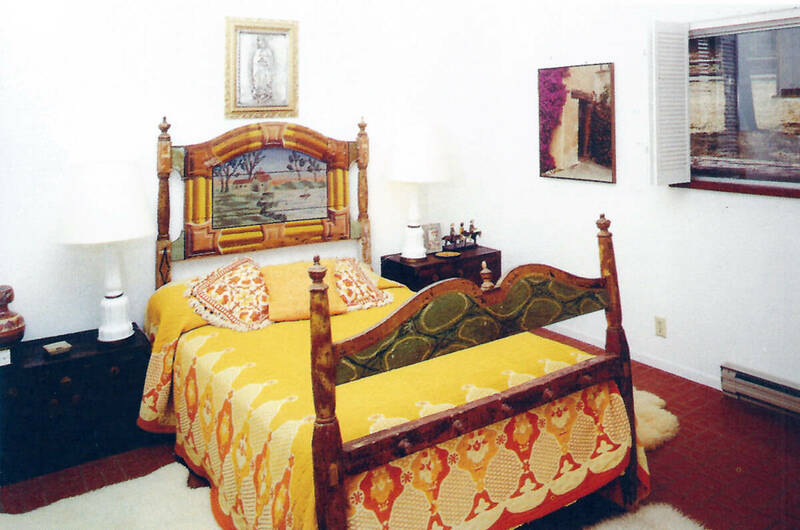 And this was one bedroom in the guest house at the ranch, where family and friends slept while visiting Rancho del Cielo. Humbling accommodations, to be sure…. That was the whole point of Rancho del Cielo. 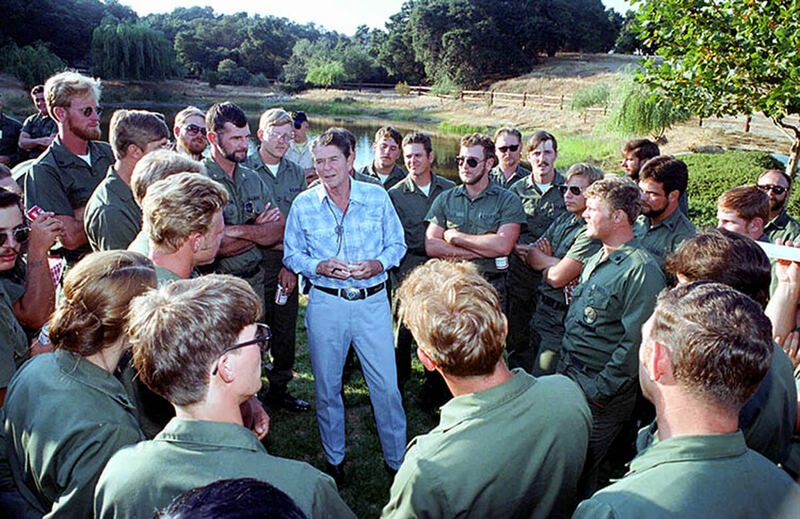 It was a reminder of what was important in Ronald Reagan’s life, who he really was as a man and his connection to nature and God. Of course, he could have had a huge mansion built on the ranch, but that wasn’t his style. He was a simple man that enjoyed the simple things in life. This view was near the helipad at the ranch, and before he would climb aboard Marine One to leave, he would pause here and say a silent prayer. He once told Barbara Walters, “I guess the Scriptural line is right: I looked to the hills from whence cometh my strength.” He enjoyed the “handiwork of God” and he called this lookout spot his “outdoor cathedral”, where he felt close to his Creator. 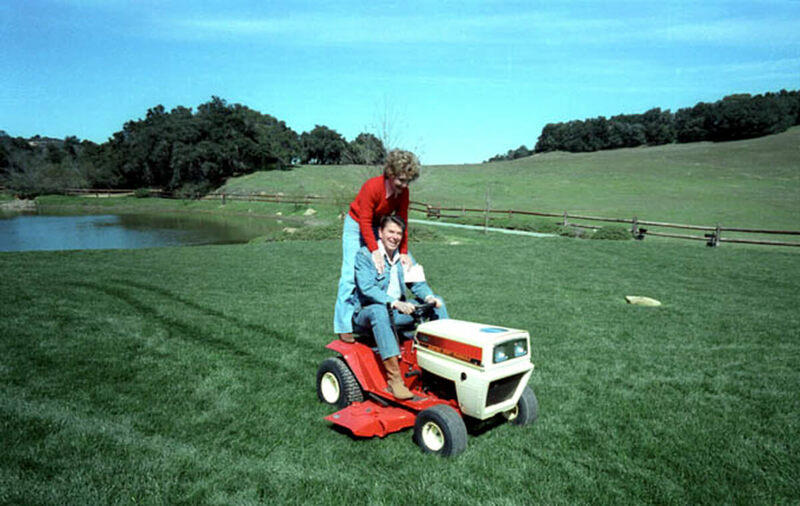 Eventually, Ronald Reagan was overcome by Alzheimer’s disease and trips to his cherished ranch ended around 1995. 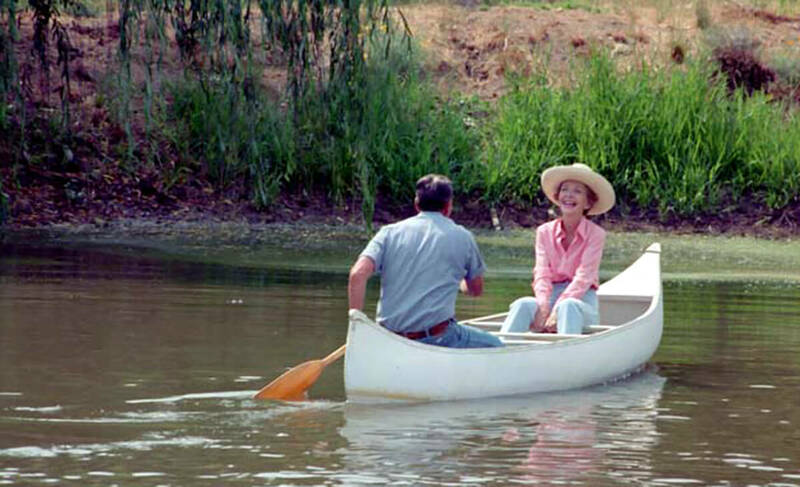 Mrs. Reagan sold the ranch to the Young America’s Foundation in 1998, and they have preserved it just as the Reagans left it, for future generations to see and understand the man and the true essence of his character. 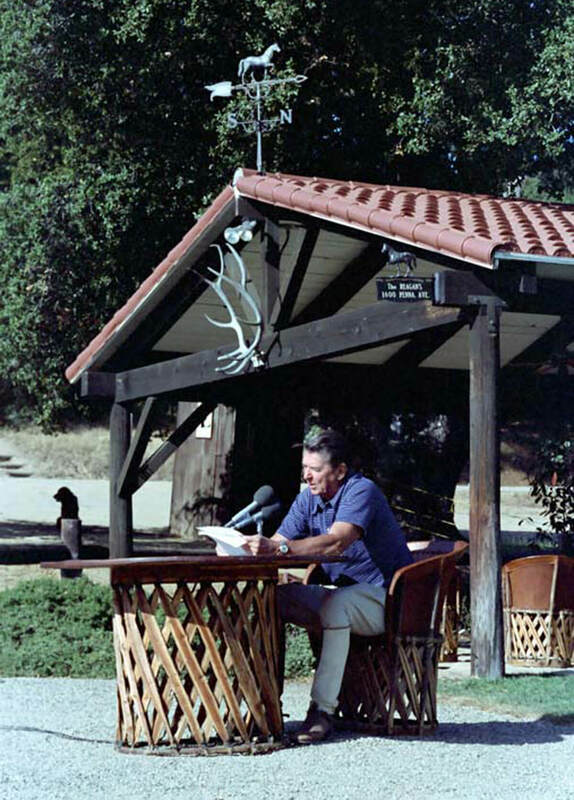 Learn more about Ronald Reagan at The Reagan Ranch Center. Learn more about the Young America’s Foundation. Sources: Michael Redmon, Kathi Brewster, Santa Barbara Historical Museum, History of Santa Barbara County, State of California: Its People and Its Resources-Owen O’Neil, ABC7, Santa Barbara News Press, Stella Haverland Rouse, Joanne Rife, Newspapers.com, The Ronald Reagan Library, John Barletta, Getty Images, Marilyn Fisher, Hadley Meares, Patti Davis, Jeff Kruthers, Wikipedia, Walker A. Tompkins, Russel Ruiz, special thanks to the Young America’s Foundation and Ron Harkey.